You Magnificent Bastards: Which Brushes Do You Use? Which Brushes Do You Use? I get asked all of the time what kind of brushes I use, so I decided to make a post out of it. For drybrushing techniques, I use Citadel Small or Large Drybrushes. They're a bit pricey, but they're by far the best brush I've found for the job. The older Citadel Small and Large Drybrushes were significantly better than the new ones, as they had stiffer bristles. For now, I make due with what they're currently selling. Perhaps I'll make it a point to try some different ones next time I hit the craft store. Now on to the brushes that I use for basecoating, blending, highlighting, and any other real work. The bristles on these brushes are Golden Taklon. It's an artificial fiber. These brushes can be purchased at local craft stores in my area, for less than $6 each. I usually purchase them online in groups of 6 or 12. I've ordered them from aswexpress.com the last few times, where they cost $3.22 and $3.05 respectively. I chose these brushes after having purchased one of each style of brush from my local craft store, and trying them all out. They have the perfect dynamic for my style of paiting. The bristles are very easy to manipulate between a sharp point, and a fanned out position. That makes them work great for basecoating, fine highlights, and broad highlights. Raphaels for example), and found those expensive brushes to be much less flexible and useful for how I paint. I've taken flak from people for using cheaper brushes, but they can't really argue with the results that I achieve with them. Keep in mind that these brushes aren't really the highest quality. If you purchase them, be sure that you choose some that don't have their bristles splayed out. They take a bit of a beating in those craft store shelves, and it'll be obvious which ones to avoid when shopping there. The online site I recommended above (aswexpress.com) has been great for delivering them in excellent quality. Occasionally a new one of these brushes will have one or two bristles that are a bit longer than they should be. If that happens; take your tweezers, and carefully pluck the long one(s) out. Be sure not to wreck other bristles when doing this. These brushes tend to wear out really fast when mistreated. They even wear out relatively fast when treated well! The following are some general tips to get the most out of them. These tips likely apply to all brushes, but I know from experience they're true of the Loew Cornelle ones. Try not to get paint, ink, wash, or even really dirty paint water down into the ferrule. That will make the bristles splay out, and make the brush completely unusable. 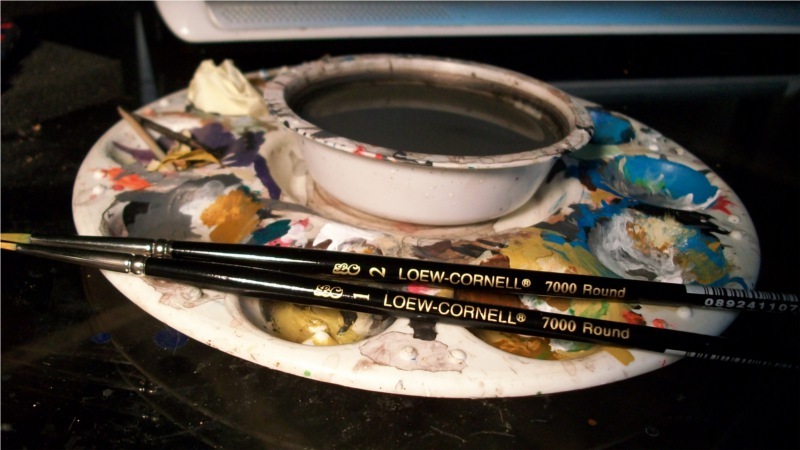 Always have a few of these brushes laying on your paint table for different tasks. I use a newer one for doing blends and layers (detailed highlights). I use a slightly older one (but one that still holds a point well) for basecoating with non-metallics. I use one that is even older than that for basecoating with metallics (a brush that still holds a point, but that is obviously about to die). I've noticed that metallic paints wear out these brushes really quick. It tends to make the bristles splay out. I think that's caused by metallic flakes getting down into the ferrule when I wash the brush. Either way, look out for this potential issue. The tip of the brush will start to curl on you. After several hours of use (between 6 to 10), that's a normal thing with this fiber. When that happens, make that brush your basecoat brush. Even when curled a bit, the brushes still hold a point very well. I've learned to use that curl to good advantage when basecoating models. Hold the brush so that the curled end is facing the model, and basecoat away. One other thing about these brushes: brush cleaner will bring them back to life. If your brush isn't holding a point very well, or the bristles are starting to splay out; then give it a good cleaning. In the Brush Cleaning 101, Master's Brush Cleaner and Preserver was recommended. That is what I use, and I recommend it too. It's affordable, you can purchase it at your local craft store (or the aforementioned aswexpress.com online store, among others, if you don't have a local store). Once the brush cleaner saves the brush, they generally make good basecoat brushes for a few more miniatures. I go through about one of these brushes a month. Admittedly I don't treat them very well, so others may get more out of them. Fortunately they're cheap enough that I don't have to worry about junking one every once in a while. I hope that at least gives you some direction to go in when considering brushes. If the ones I do recommended here don't work, do what I did. Go to the craft store and buy one of every brush that looks like it might work. Go home, and use each one til it is no longer usable for you. Pay close attention, and even take notes, about which ones work the best for you. Thanks for the tip Hastings! I will give them a shot. I am not a huge fan of the WN s7 so this was a lot of help. Keep it up!